For the past few years, I would make a Halloween buffet for family and friends! When they'd get back from trick or treating, the spread would be done and they can begin to dig in. My son truly appreciates the effort and it's one thing he looks forward to every year. So just imagine my excitement when my friend and Mothers Who Brunch partner, Michelle told me that she loves Haloween too! We went ahead and planned every spooky little detail! We had to involve the kids too, so we told the moms we invited to bring one of their kids to enjoy a spooky brunch with us! We were also lucky to have the Boqueria Lifestyle Market team because they instantly got our vision and transformed the lovely Viking Range showroom into a spook-tacular room! The spooky food! Every little detail of the buffet spread was lovingly made by Michelle and myself and we had so much fun with this menu!!! The kids had fun learning how to make ice cream thanks to the SMILE Group and Engineering for Kids! They even went down to their mommies and made us taste their work. Really yummy, in fact!!! While the kids were upstairs making ice cream, the moms were busy sewing their felt Halloween loot bags thanks to Ann from Ant’s Pocket, it was so cute and it fit right into our theme! 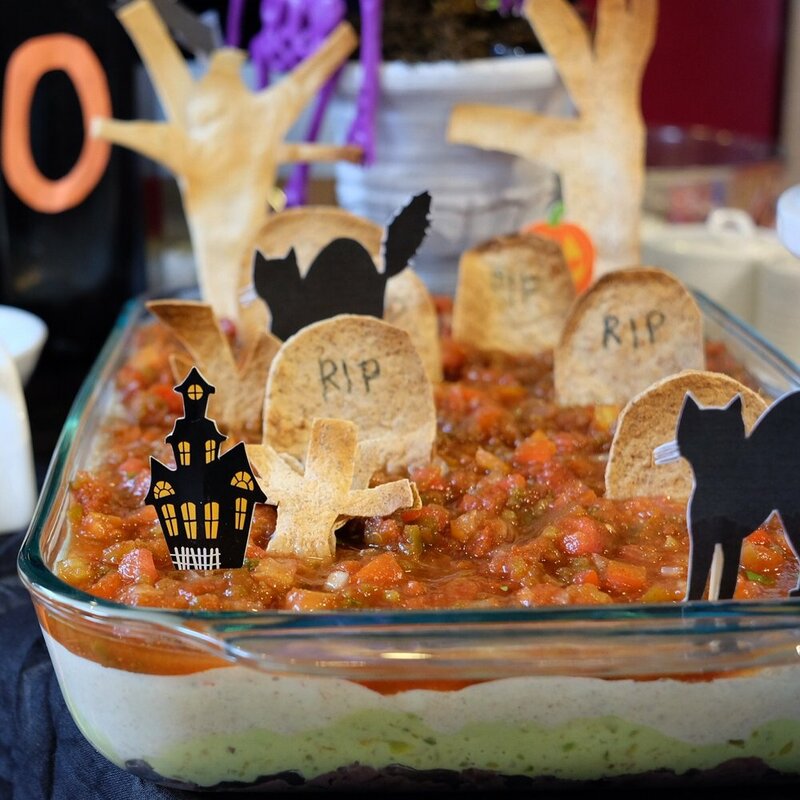 This Graveyard Taco Dip is such a yummy and cool buffet centerpiece! Easy to prepare too! Enjoy! In a sauce pan place red beans, garlic and water and let it boil until water evaporates, about 3-5 minutes. Start mashing beans and stirring until it has dried a bit. Season with salt and pepper. In a small bowl, mix the sour cream and taco seasoning. In another small bowl, mix the mashed avocados, minced garlic, and mayonnaise. In a small Pyrex dish or pie plate, layer the beans, sour cream mixture, avocado mixture, and salsa. Sprinkle the spring onions on top. Chill at least an hour, or until ready to serve. To make the tombstones and tree, cut the shapes you want out of 2 large tortillas. Place the cut-out shapes on a parchment paper lined cookie tray and bake at 350 degrees until the tortillas are nice and brown. You can add text to the tombstones with a black food safe marker. Put the tombstones and tree in the dip just before serving. Thank you, thank you to our sponsors for making this such a fun and enjoyable experience not only for the moms but the kiddos too!!! Thank you Viking Range Philippines for your amazing kitchen equipment which made it all the more fun and easy to cook the Halloween feast!!! Thank you Boqueria Lifestyle Market for the spook-tacular styling, as always!!! Thank you GLAD and Clorox Wipes for making it easy to prep, cook and clean while prepping for our buffet!!! Thank you so much to the SMILE Group and Engineering for Kids for sponsoring such a fun and yummy ice cream making activity!!! Thank you Ann from Ant’s Pocket who added to the whimsy of the place with her felt plushies and for also keeping the mothers busy sewing super cute felt loot bags!!! Thank you Pottly N Tubby for customizing a halloween-themed teepee that served as the kids' play area!!! And also the GCs for the moms to enjoy a discount of your other cute home products! Thank you Cupcakes by Sonja for creating our spook-tacular Halloween themed desserts!!! Thank you Lemons & Greens for the Argentenian lemons that we made into Lavender Lemonade (which all the guests loved!! ), the oranges and kale (that we quickly made into kale chips! Yum!)! And for making sure that the moms enjoyed them too!!! Thank you Jam Foods for making it extra easy for us to add another dish to our menu so that we could feed everybody! This ribs were soooo good and all your other products are just my family's favorite for breakfast!!! Thank you Coco Natura for helping us be more mindful and prepare healthier for our kids with your coco sugar products!!! We used them for the Cocoa-Cayenne Popcorn Balls!!! The kids loved the cookies baked with coco sugar as well as the Fog City Creamery ice cream made with Coco Natura!!! Thank you Zin Manila for the yummy finishing salts that brought our dishes to another level. We used the Rosemary and lemon salt for the Bat Wings and also the Coffee salt for the ribs! Yum!!! Thank you Whisk dips and dressings!!! We used the Raspberry Vinaigrette with our salad and we served the Mushroom Artichoke and Roasted Garlic Jam for appetizers. You really were our savior cause it kept the mothers and kiddos busy while we were waiting to cook the other dishes! Their products are also perfect gifts for the coming holidays! Thank you also to our wonderful photographer/videographer Jay Santos for capturing beautiful and fun moments with our kids!